Adrianne L. Plier, “Adie”, 64, of Hwy LL, Town of Port Washington died Monday July 11, 2005 at Columbia St. Mary’s Hospital-Ozaukee Campus in Mequon. She was born February 20, 1941 in Port Washington to Theodore and Lorraine Goetter Rismeyer. She met Donald H. Plier of Port Washington and they were married at St. Mary’s Church in Port Washington on September 29, 1962. Adie worked in housekeeping at the former St. Alphonsus Hospital, Port Washington and the current Columbia St. Mary’s Hospital, Ozaukee Campus in Mequon for over 20 years. 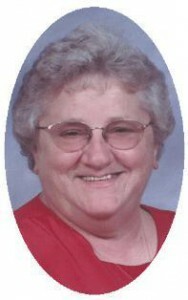 She was a member of St. Peter of Alcantara Catholic Church and enjoyed her family, especially the grandkids. Adie liked being outdoors and spending time up north with the family. She loved feeding the birds, especially her hummingbirds. She also enjoyed a quick run to Onieda for an afternoon of fun. Adie is survived by her husband Donald, children Rich (Debbie) Plier of Port Washington, Dan (Tracy) Plier of Random Lake and Pat Plier of the Town of Port Washington and grandchildren Carrie, Josh, Spencer and Shawna Plier. Further survived by brothers Cliff (Marion) Rismeyer of Port Washington and Donald (June) Rismeyer of Fond du Lac; sisters Betty “Mutsy” Bodi of Milwaukee and Cynthia “Sis” (Roger) Keller of Port Washington; sisters-in-law Nancy (Norbert) Ansay of Port Washington and Charlotte Rismeyer of Saukville; brothers-in-law Merlin (Effie) Plier of Fond du Lac, Franklin “Joe” (Kathy) Plier, Sylvester “Butch” (Lynn) Plier, both of Port Washington and Eddie Beke of Milwaukee, other relatives and friends. She is preceded by her parents, Don’s parents Sylvester Plier & Adolph & Marcella Plier Witte, her sisters Beverly & her husband Joe Yovanovich, Shirley Voeller, Janis Beke, brothers Wally, Raymond “Ziggy” and his wife Jean Rismeyer and bro-in-law Louie Bodi. The Rev. Allan Sommer will celebrate her Funeral Mass at 7:30 pm Thursday, July 14, 2005 at St. Peter of Alcantara Catholic Church, 1802 N Wisconsin Street, Port Washington. Interment parish cemetery. Visitation 4 – 7 pm Thursday at church. Memorials appreciated.